The AGM meeting for the VNBC was a good opportunity for the club to review what has happened over the past year, and to give some thought to the coming year as well. 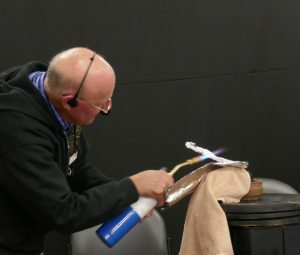 The President’s Report highlighted the range of interesting presentations and demonstrations at club meetings and workshops over the year, including three demonstrations under the AABC Visiting Tutor Program, and other specialist presenters as well. 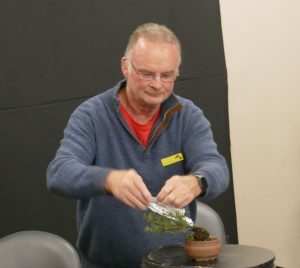 Other highlights for the year included the successful exhibition and sales weekend in April, the various workshops and critique sessions, and the pottery classes held as part of a couple of the Saturday workshops. 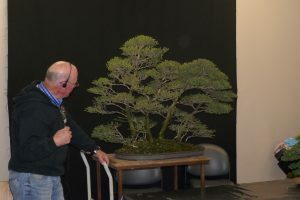 The Club Special Recognition Award was presented to Gerard Schoofs, for his continuing ready support to the club through a wide range of activities, and the Encouragement Award was presented to Matt Hudson, to recognize his work in development of Australian native species as Bonsai over the past year. The Committee for 2018-19 consists of President – Quentin Valentine, Vice President – Kevin Ritchie, Secretary – Marcela Ferriera, Treasurer – Paul Weir, and Committee Members – Kerry Wallace and Matt Hudson. 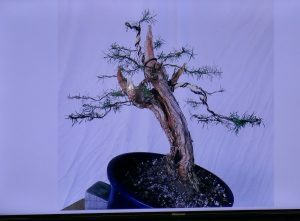 With the completion of AGM formalities, the remainder of the night consisted of a demonstration of deadwood bending, and a review of the progress in development of several trees which had been the subject of initial work as part of various demonstrations at previous club meetings. 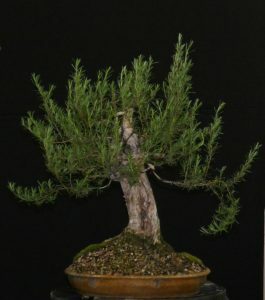 The deadwood bending demonstration on a small Leptospermum juniperinum, which had a long-dead previous branch. 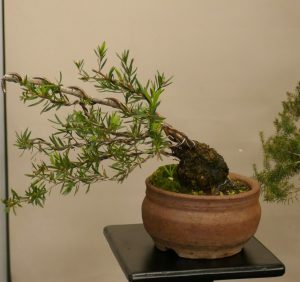 This was wired, soaked in wet coverings for a few days prior to the night, and then unwrapped and heated with a blowtorch, followed by bending pressure to give the branch some more interesting movement. 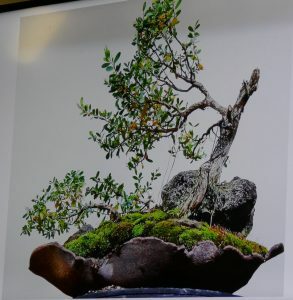 Group planting of Moonah (Melaleuca lanceolata), first assembled at the National Symposium on Australian Natives as Bonsai, in Melbourne, 2015, with subsequent additional work at a club meeting. … to this, in 3 years. 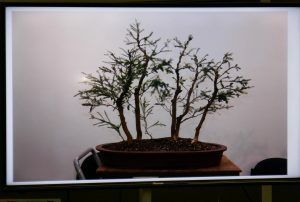 Leptospermum laevigatum, Coastal Tea Tree, developed at the club’s AGM 2 years ago, in 2016. Two years to develop to this (2018)…. 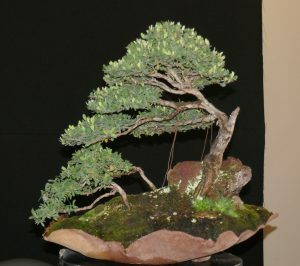 And also, a Burgan dug from the wild, and remodeled by Albert Garcia during his visit early this year.